I wanted to bake another potato bread. After Kartoffelbrot, an amazingly soft and porous potato bread, i wanted to make another one. While googling for potato bread, i came across this italian rosemary bread, Panmarino. It is an Italian bread baked with fresh rosemary and sea salt sprinkled on top. The story goes behind this amazing bread goes like this, A baker named Luciano Pancalde who lived in Ferrara near Venice was once reading the biography of the d'Este family who were the rulers of Ferrara, and came across descriptions of their grand court banquets. Some of these banquets also served a rosemary bread that had a sea salt sprinkled crust that “sparkled with diamonds”. 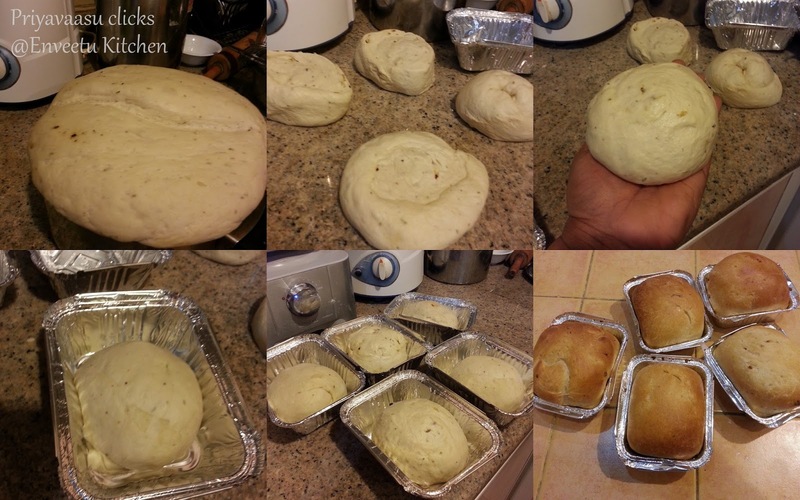 So Lucioano Panclade experimented with dough to reproduce a similar rosemary bread and the result was the dome shaped, sea salt crusted Panmarino that is spiced with the fragrance of rosemary. The recipes i came across for this bread, had a fermentation time for the biga as 12-16 hours and none included potatoes or garlic. But the source i followed has baked it from the Bread Baker's Apprentice Book, so without doubting the source even a bit, i just followed her recipe to the T. Only one change i made was to use dried rosemary, since i didn't have fresh rosemary or sea salt in hand. Stir together the flour and yeast in a bowl. Add water, stirring until everything comes together and makes a ball (or mix on low speed for 1 minute). Adjust the flour/water, accordingly, so that the dough is neither too sticky nor too stiff. (It is better to be on the sticky side, as you can adjust easier during kneading). Sprinkle some flour on the counter and transfer the dough to the counter. 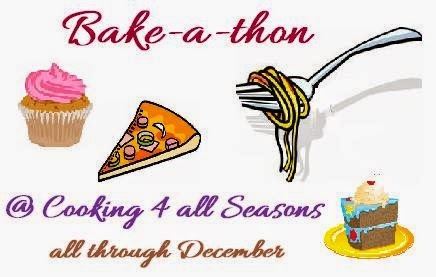 Knead for 4 to 6 minutes (or mix on medium speed for 4 minutes), or until the dough is soft and pliable. Lightly oil a bowl and transfer the dough to the bowl, rolling it around to coat it with oil. Cover the bowl with plastic wrap and ferment at room temperature for 2 to 4 hours, or until it nearly doubles in size. After the initial fermentation the dough can be refrigerated for 3 days and can be frozen for 3 months. Remove the biga from the refrigerator 2 hours before you plan to make the bread, so it reaches room temperature. Since i made the bread the same day i didn't refrigerate the biga, so skipped this step. I used my food processor to make the dough as it is a bit sticky dough to handle. I kneaded the initial part in the processor, once the dough was mixed i had to use my hands to knead it soft, since my processor wasn't ready to move an inch with a sticky dough. Stir together the flour, salt, black pepper, and yeast in a bowl. Add the biga pieces, mashed potatoes, oil, rosemary, and 3/4 cup water. Stir with a large spoon (or mix on low speed) for 1 minute, or until the ingredients form a ball. Add more water, if necessary, or more flour, if the dough is too sticky. Sprinkle flour on the counter, transfer the dough to the counter, and begin to knead. Knead for approximately 10 minutes (or 6 minutes by machine), adding more flour if needed, until the dough is soft and supple. It should pass the windowpane test. Flatten the dough and spread the roasted garlic over the top. 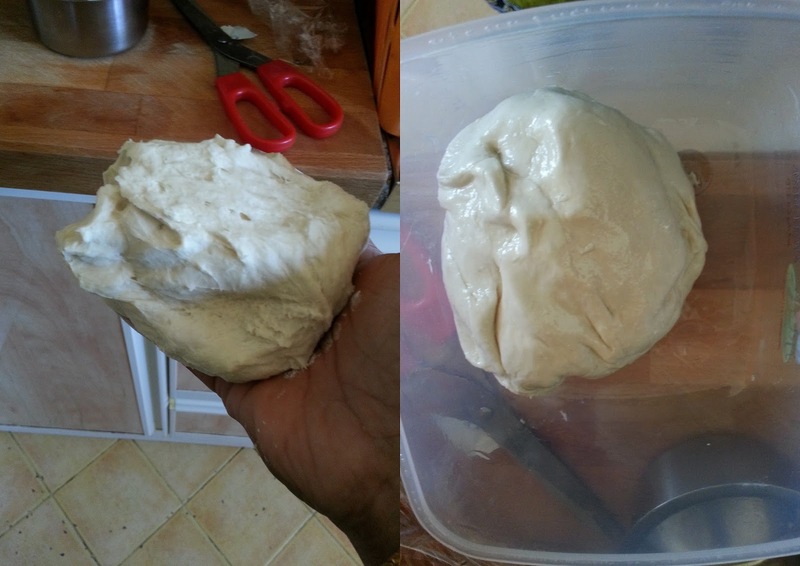 Gather the dough into a ball and knead it by hand for 1 minute. Lightly oil a large bowl and transfer the dough to the bowl, rolling it around to coat it with oil. Cover the bowl with plastic wrap. Let it sit at room temperature for approximately 2 hours, or until the dough doubles in size. 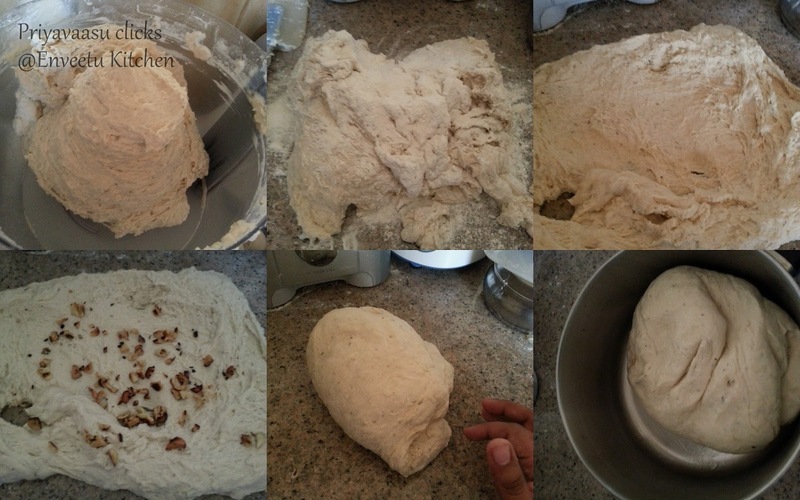 Remove the dough from the bowl and divide it into 2 equal pieces for loaves, or 18 equal pieces (about 2 oz. each) for dinner rolls. I divided the dough into 5 loaves each weighing around 275gms. Shape the balls into a boule. I just rolled it softly in my hands to form a ball and placed them in a medium sized disposable alu-foil pan. Let it sit again at room temperature for 1 to 1.5 hours (depending on the size of the pieces), or until the dough doubles in size.Preheat the oven to 220C for 15 minutes. Place the pans in the oven. Bake the loaves for 20 minutes, and reduce the temperature to 180C and bake for another 15 minutes. The loaves will have a lovely golden brown on top. Once done, remove the loaves to a wire rack to cool completely. We enjoyed the bread with homemade Spiced coriander labneh for our breakfast. You can even serve them with simple cream cheese. They make a great combo with a warm bowl of soup too. Wow! Lovely texture and crumb. Nice color. Everything about this bread is so good! Panmarino looks fabulous with lovely crust, very spongy and porous. Priya you have got that bread looking wow!..seriously such wonderful results..guess I can experiment with regular flour as well!..really a topper I say! The final pic is truly inviting Priya! Yum!!! !